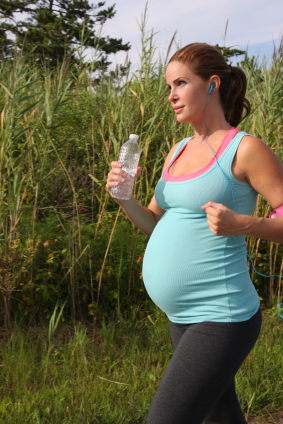 Pregnant or not, warmer weather often inspires us to get outside and get active. For most of us, that is a very good thing! Moderate strength training and aerobic exercise can be very beneficial during pregnancy as it helps strengthen the heart, lungs, bone and muscles and helps prepare the woman’s body for her upcoming labor and birth. Healthy pregnant women can usually safely participate in moderate aerobic exercise for at least 30 minutes a day, but there are some extra considerations and precautions that pregnant women need to take prior to beginning an exercise program. As you know, pregnancy changes things. But you may not know that there are cardiovascular and respiratory changes that occur during pregnancy. The increasing level of progesterone during pregnancy has an effect on the respiratory center of the brain. It causes the pregnant woman to breathe more frequently than she did prior to pregnancy. As her expanding uterus and pressure from the diaphragm causes her lung capacity to decrease, her rate of respiration increases. By the end of the third trimester, her oxygen consumption has increased by 36%. Also, the pregnant woman’s blood volume increases (40% by 34 weeks), which causes her heart to pump more frequently (an extra 10-15 beats per minute) even while resting. Because of these and other changes, it is very important to get a thorough obstetrical medical exam prior to beginning a perinatal exercise program. Even a woman who has been involved in competitive or recreational athletics needs to have an obstetrical medical exam prior to training to identify possible risk factors. Certified perinatal fitness instructors require a medical waiver before enrolling pregnant women into their classes. It is important to know if aerobic exercise is safe for you and your baby. There are some risk factors and contraindications that pregnant women should be aware of. Any pregnant woman involved in a strenuous exercise program should be closely medically supervised. Anemia, bronchitis, cardiac arrhythmia, Type 1 diabetes that is not controlled well, being extremely thin or extremely obese, never exercising prior to pregnancy, intrauterine growth retardation (IGR), high blood pressure, hyperthyroidism that is not controlled well, orthopedic issues, seizure disorder that is not controlled well or being a heavy smoker. Significant heart disease, restrictive lung disease, incompetent cervix or cervical cerclage, multiple babies at risk for premature labor, second or third trimester bleeding, placenta previa still present after 26 weeks of pregnancy, premature labor, amniotic membrane rupture or preeclampsia. Chest pain, difficulty breathing, dizziness, headache, muscle weakness, vaginal bleeding or any pain, including back/pelvic area. If your obstetrician or midwife has not found any contraindications for you to participate in perinatal aerobic exercise, you can gain a lot of benefit from 30 minutes or more of regular, moderate exercise every day of the week during pregnancy and after postpartum. This entry was posted in Perinatal Exercise, Perinatal Exercise & Fitness. Bookmark the permalink.